Died at Rome, 19 Nov., 496. Gelasius, as he himself states in his letter to the Emperor Anastasius (Ep. xii, n. 1), was Romanus natus. The assertion of the “Liber Pontificalis” that he was natione Afer is consequently taken by many to mean that he was of African origin, though Roman born. 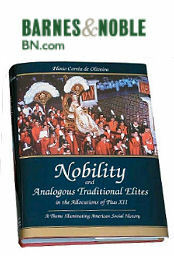 Others, however, interpreting natione Afer as “African by birth”, explain Romanus natus as “born a Roman citizen”. Before his election as pope, 1 March, 492, Gelasius had been much employed by his predecessor, Felix II (or III), especially in drawing up ecclesiastical documents, which has led some scholars to confuse the writings of the two pontiffs. 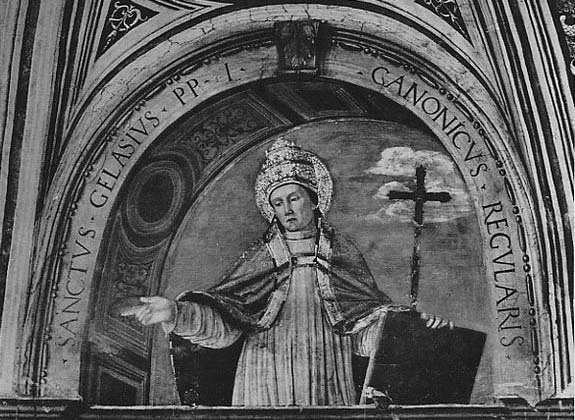 On his election to the papacy, Gelasius at once showed his strength of character and his lofty conception of his position by his firmness in dealing with the adherents of Acacius. 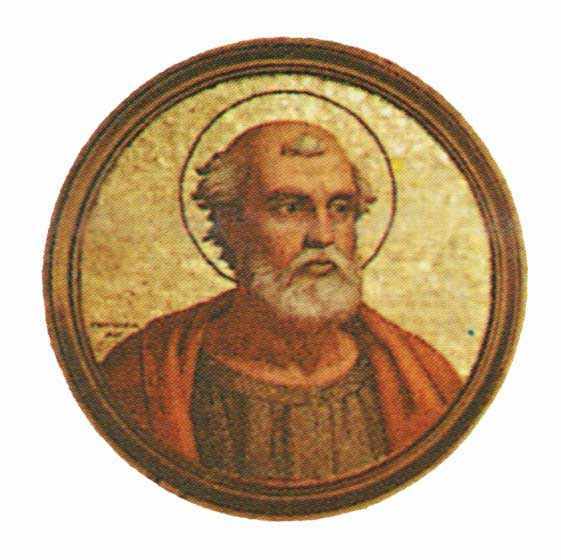 Despite all the efforts of the otherwise orthodox patriarch, Euphemius of Constantinople, and the threats and wiles by which the Emperor Anastasius tried to obtain recognition from the Apostolic See, Gelasius, though hard-pressed by difficulties at home, would make no peace that compromised in the slightest degree the rights and honor of the Chair of Peter. The constancy with which he combated the pretensions, lay and ecclesiastical, of the New Rome; the resoluteness with which he refused to allow the civil or temporal pre-eminence of a city to determine its ecclesiastical rank; the unfailing courage with which he defended the rights of the “second ” and the “third” sees, Alexandria and Antioch, are some of the most striking features of his pontificate. It has been well said that nowhere at this period can be found stronger arguments for the primacy of Peter’s See than in the works and writings of Gelasius. He is never tired of repeating that Rome owes its ecclesiastical princedom not to an oecumenical synod nor to any temporal importance it may have possessed, but to the Divine institution of Christ Himself, Who conferred the primacy over the whole Church upon Peter and his successors. (Cf. 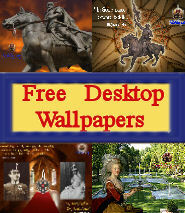 especially his letters to Eastern bishops and the decretal on the canonical and apocryphal books.) 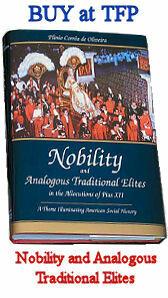 In his dealing with the emperor he is at one with the great medieval pontiffs. “There are two powers by which chiefly this world is ruled: the sacred authority of the priesthood and the authority of kings. And of these the authority of the priests is so much the weightier, as they must render before the tribunal of God an account even for the kings of men.” Gelasius’s pontificate was too short to effect the complete submission and reconciliation of the ambitious Church of Byzantium. Not until Hormisdas (514-23) did the contest end in the return of the East to its old allegiance. Troubles abroad were not the only occasions to draw out the energy and strength of Gelasius. The Lupercalia, a superstitious and somewhat licentious vestige of paganism at Rome, was finally abolished by the pope after a long contest. Gelasius’s letter to Andromachus, the senator, covers the main lines of the controversy. 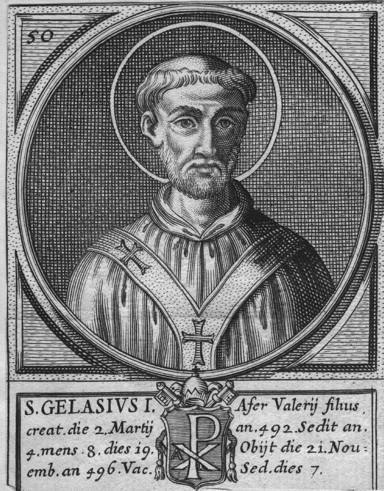 A stanch upholder of the old traditions, Gelasius nevertheless knew when to make exceptions or modifications, such as his decree obliging the reception of the Holy Eucharist under both kinds. This was done as the only effective way of detecting the Manichaeans, who, though present in Rome in large numbers, sought to divert attention from their hidden propaganda by feigning Catholicism. As they held wine to be impure and essentially sinful, they would refuse the chalice and thus be recognized. Later, with the change of conditions, the old normal method of receiving Holy Communion under the form of bread alone returned into vogue. To Gelasius we owe the ordinations on the ember days (Ep. xv), as well as the enforcement of the fourfold division of all ecclesiastical revenues, whether income from estates or voluntary donations of the faithful, one portion for the poor, another for the support of the churches and the splendour of Divine service, a third for the bishop, and the fourth for the minor clergy. 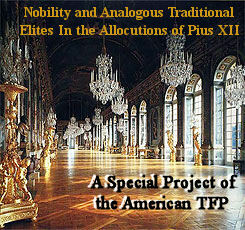 Though some writers ascribe the origin of this division of church funds to Gelasius, still the pontiff speaks of it (Ep. xiv, n. 27) as dudum rationabiliter decretum, having been for some time in force. Indeed, Pope Simplicius (475, Ep. 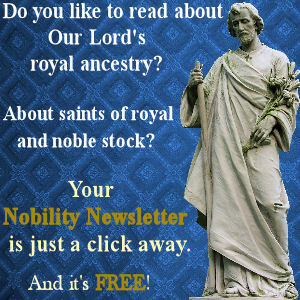 i, n. 2) imposed the obligation of restitution to the poor and the Church upon a certain bishop who had failed in this duty; consequently it must have been already regarded as at least a custom of the Church. Not content with one enunciation of this charitable obligation, Gelasius frequently inculcates it in his writings to bishops. For a long time the fixing of the Canon of the Scriptures was attributed to Gelasius, but it seems now more probably the work of Damasus (367-85). As Gelasius, however, in a Roman synod (494), published his celebrated catalogue of the authentic writings of the Fathers, together with a list of apocryphal and interpolated works, as well as the proscribed books of the heretics (Ep. xlii), it was but natural to prefix to this catalogue the Canon of the Scriptures as determined by the earlier Pontiff, and thus in the course of time the Canon itself came to be ascribed to Gelasius. In his zeal for the beauty and majesty of Divine service, Gelasius composed many hymns, prefaces, and collects, and arranged a standard Mass-book, though the Missal that has commonly gone by his name, the “Sacramentarium Gelasianum”, belongs properly to the next century. How much of it is the work of Gelasius is still a moot question. Though pope but for four years and a half, he exerted a deep influence on the development of church polity, of the liturgy and ecclesiastical discipline. A large number of his decrees have been incorporated into the Canon Law. P.L., LIX, 9-191; CXXVIII, 439; CXXIX, 1210; THIEL, Epistolae Romanorum Pontificum Genuinae (Braunsberg, 1868), I, 285-613, 21-82; JAFFE, Regesta Pontificum Romanorum (Berlin), I, 53-60; DUCHESNE, Le Liber Pontificalis (Paris, 1886) I, 254-257; GRISAR, Geschichte Roms und der Papst eim Mittelalter, I, 452-457, passim; THOENES, De Gelasio I Papa (Wiesbaden, 1873); Roux, Le Pape Gelase (Bordeaux-Paris, 1880). For the Sacramentary of Gelasius see PROBST, Die altesten römischen Sacramentarien und Ordines (Munster, 1892); BISHOP, The Earliest Roman Mass-book in Dublin Review (Octoher, 1894); WILSON. The Gelasian Sacramentary (Oxford, 1894): WILSON, A Classified Index to the Leonine, Gelasian and Gregorian Sacramentaries (Cambridge, 1890); also P.L., LXXIV, 1049.